Alright, so maybe Bonnaroo and Coachella are a bit far off in the future, but it’s never too late to get excited about their imminent arrivals! With Elton John, Kanye West, and Jack White headlining Bonnaroo; Outkast, Muse, and Arcade Fire headlining Coachella, and many more amazing musicians/bands showcasing their talents at the two festivals, there is much about which to be excited. Bonnaroo is a little more than 100 days away; Coachella is just 40 days away; and spring break 2014 is happening right now. As many people are parading off to Mardi Gras in New Orleans and the beach for a week of relaxation and wild festivities, I’m sure they would appreciate a playlist to get them to where they’re going and make their trips more enjoyable. So, wherever you’re going for spring break, whether flying out or road tripping, or simply going home for some much-needed R&R after a stressful week of midterms, here is a playlist of catchy tunes by some of the artists who will be performing at this year’s Bonnaroo and Coachella to spice up your spring break! Simon Green, better known by his stage name, Bonobo, will be performing at Coachella this year. “Ten Tigers,” a chill tune perfect for a relaxing drive to the beach, comes from his 2013 album The North Borders. Bombay Bicycle Club, will also be at Coachella this year. Check out this upbeat tune from their 2009 album I Had the Blues but I Shook Them Loose. Arctic Monkeys will be performing at Bonnaroo 2014. So, if you enjoyed their latest album, AM, consider taking a road trip down to The Farm to see them in June. Phosphorescent is another artist who will be at Bonnaroo this year. Give “Song for Zula” a listen if you’re in the mood to relax (or if you need some time to recover after Mardi Gras). Other acts to perform at Coachella 2014 are Los Angeles-based Haim and the Portland electronica band STRFKR. And finally, here are three songs by three artists/bands who will be making appearances at both festivals. 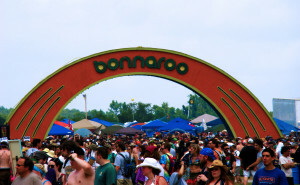 Next Post WRVURoo: Win Two Tickets to Bonnaroo!! !